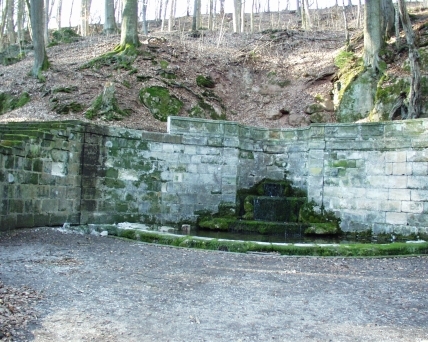 "Sophienquelle" is the largest tapped baroque spring north of the Alpes. It has been built in between 1723 and 1726. Johann Paul III. Paumgartner initiated the construction work and his young widow Sophia Maria, née Nützel von Sündersbühl completed it. The spring is named after Sophia Maria. From the very beginning the spring could be visited by the public and it is a popular destination for hikers. Residing in the middle of the forest at one of the branches of the Way of St James it has been captured in many paintings and photographs. At the begin of the 19th century it even has been made and sold as a tin toy. Many people love its delicious water. In summer as well as winter the water flows at finest quality at around 10°C. That's why it does'nt freeze in winter. However, now it is requiring our help: once again "Sophienquelle" has become a victim of a mean vandal. Already in 2006, somebody had smashed one of the last baroque sandstones at the left side of the balustrade and the pieces thrown into the basin, fortunately without damaging it. And in order to prevent a reconstruction from the ruins, the vandal even had stolen several pieces. Only after all this had been reported to the police and the press, the stone plaque giving the history of the spring and its restoration chronology had been blasted out of its frame, smashed and again about one third of the pieces got stolen. Only a short time prior to this, one of the sandstones of the middle of the balustrade having been damaged in the 1980s had been replaced with the help of many donations. Around 10 February 2011 vandals have stroken again. This time the three adjacent sandstones on the left have been pulled out of their anchoring and tilt into the basin of the spring. The damage is such that the ruins cannot be re-composed. It seems that again some pieces have been stolen. This time the material damage amounts to around 20,000 € which would have to be afforded by the trust Stromer’sche Kulturgut-, Denkmal- und NaturStiftung as the owner of this popular monument. However, the immaterial damage is much bigger. Even when one day the new stones will have been made and financed, it’s yet new stones and not the historic ones, which have been used by the great-grandaunt of the administrator in memorial of her great-grandmother Sophia Maria Nützel-Paumgartner-Haller for restoring the spring 150 years ago. The vandal has not only heavily harmed the trust, but all people enjoying "Sophienquelle", drinking its water, watching the fishes again swimming in the pond after decades of absence, who are dancing there or simply play or stay by candlelight. Despite the fact that "Sophienquelle" is publicly accessible, the trust alone is accountable and responsible for its maintenance. And, for sure, no insurance will insure such a kind of monument. Therefore, for enabling the restoration of "Sophienquelle" the trust is depending on donations. Donation receipts can be provided. Otherwise the spring has to remain in its damaged condition and would have to be barred for the public because of the falling hazard. After the general restoration of the castle the trust is not in the position to finance the repair of the balustrade within the next few years. All donations to the trust tax deductable. For relevant hints leading to the seizure of the offender, the trust promises a reward of 500 €.